Join the Rot-a-Lot home composting club. Reduce the amount of waste you throw away and help to make your garden more beautiful. Rot-a-Lot is a free home composting club for residents of Leicester and Leicestershire. It’s designed to help you get the best from your compost bin, whether you are a total beginner or have been composting for years. 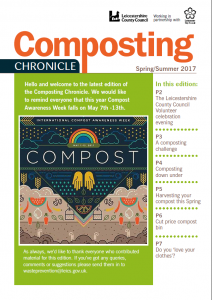 The Composting Chronicle is sent to Rot-a-Lot club members twice a year (usually Spring and Autumn) by email. It contains a wealth of tips and information to help you compost successfully each season.